Does Your Mouse Frighten You? I mean, of course, the mouse that lives on your desk! When you look at your mouse, mobile phone, or musical instrument, or you have to perform an activity regularly such as pushing a baby buggy, do you get a sinking feeling and feel afraid that it is gradually causing you to have repetitive strain injury, RSI, carpal tunnel syndrome (CTS) or some other form of occupational overuse syndrome (OOS)? Do you fear you will experience increasing and continuous pain as you work? At this point, many people decide to seek help to re-organise their desk set-up and buy an ergonomic mouse, new keyboard, new mobile phone, violin chin rest or new whatever, and hope these will solve the problem. It is certainly important to adjust equipment to be in the best position for us in relation to our bodies and to use the most suitable tools for the task at hand. This also applies to people that hot desk at work (or share cars), who need to make sure they adjust the VDU, keyboad, mouse and seat to suit themselves - not to leave them in the position that suited the person who used them previously. That's a good start. Why Don't Ergonomic Mice and Keyboards Solve the Problem Long Term? Well, if you think about it, the mouse and keyboard may change if you buy a new design but, importantly, the manner in which they are being used almost certainly hasn't changed - often the user just gets more tense with worry and is in yet more pain. This is a distressing situation to be in but there can be a way out of the mousetrap. RSI sufferers (and indeed many people who experience pain such as headaches and backache whilst working), need to get to the point of recognising that a new mouse, new desk, phone, erganomic chair, or some other new piece of equipment, is only one part of the answer. HOW you use your equipment is the next important question to address. Make a start by taking frequent breaks and do less! Stop before the pain builds up and refuse to get into a 'driven' or superwoman mode. Choose to work in a calm, balanced, freely relaxed and thoughtful manner. It is very different to work freely and quickly, rather than being driven and rushed, full of tension. Alexander Technique lessons can help you achieve this. Explore learning to do some actions and jobs with your non-dominant hand, to help us be aware of how you perform these actions and to help balance your body-use. For instance, do you always open doors and turn lights on off with your dominant hand? It can be fun doing it differently and gradually trying more complicated activities such as being able to use a mouse with either hand. This can be particularly helpful if you have RSI - but take care, sometimes people end up with both hands hurting, if they perform actions in the same old habitual way that they have done for years! When someone is in severe pain Doctors often say that it's necessary to rest and immobilise the hand as much as possible, helped by wearing a firm wrist support that restricts wrist movements and over flexion. If you wear a support for too long, it is possible to lose strength in the muscles but using one for a while can often help, if we learn from the process. Investing in a computer programme that limits the time you spend working before you take a rest, or using a voice-activated programme can also help people change the way they work and minimising the time they need to use their damaged hands. These measures allow the muscles and tendons to calm down and begin to heal. However, at some stage the sore hands and arms will need to be used again but, if something hasn't changed in the way they are being used, the pain is likely to come back again. Essential to getting better is to begin to understand what we personally do when we work that contributes to our problems. This is not about blame but about practicalities. For instance working when feeling stressed, exhausted, angry, miserable or afraid, or driving ourselves towards a deadline, or over-practising playing a musical instrument, usually gets us tensing, winding ourselves up and contracting down into ourselves. This hinders the free use of our hands and arms as we work and tends to create discomfort which can, if it happens continually, build up into the pain associated with RSI. Recognising our habitual patterns means that we can learn to let go of them and can therefore make different choices about how we act (or not act) so that our bodies have a chance to heal. Many clients come to Alexander Technique lessons at the point when they just don't know what to do and feel trapped by RSI. In AT lessons, you willl be helped to recognise your patterns of movement, attitudes and reactions that you habitually get into when you go about your activities and, with the help of the teacher, you can learn to let go of those that don't serve you. For example, many people needlessly tighten their neck muscles as they sit down and stand up. 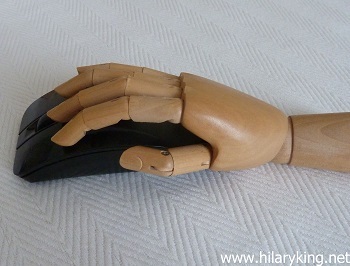 Many clients tense their hands as they reach out towards the keyboard and mouse, particularly if they expect to get pain when they use them - but they are not aware of the fact that they are reacting to this little mouse as if it has become a monster, so don't at first recognise that they tighten up their muscles and defend themselves against it. Very often, people begin to tighten their muscles at the mere thought of working, let alone touching the monster mouse! Ask yourself 'what do I think and feel about using a mouse/ violin; do I react to the mouse/phone by tensing my hands; do I notice any other bodily tension as I begin to work?' Questions such as these, and their answers, can be very revealing about how we use ourselves as we work, so our subtle habits and reactions are revealed and are well worth thinking about. These subtle but continual patterns of reacting to situations with tension all build up and are the sort of thing that can make using a mouse more and more uncomfortable, so that muscles and tendons are continually irritated, which gradually causes pain. In order to change such habits, the Alexander teacher's hands gently touch pupils as they make simple movements, so that the teacher can guide them and help them become aware of how they react to the thought of moving, how they move and what they are doing whilst they move. The teacher will, for instance, gently touch a pupil's neck muscles whilst she is moving to sit down, so she can recognise her habit of tightening and shortening her muscles and gradually, she can learn to stop doing this. Similarly, once a basic understanding of the Technique has been obtained by the pupil, habits such as tightening the hands whilst using a mouse or musical instrument can be worked on in lessons, so the the pupil can begin to approach those activities in a quieter manner that allows the hands to be used more freely and easily, which reduces or even stops the pain. However, we tend to keep going back to our old habits because they are familiar to us, so we have to keep reminding ourselves to use ourselves in the new, freer manner. Pain is a good teacher too! It will soon remind RSI sufferers if old habits are creeping back in and causing problems. If this happens, it is important to use all the Alexander Technique that has been learned and to consciously think about our use whilst working. In this way, we can usually stop the pain again - but the main aim is to say 'no' to reacting in our old way, so that we avoid getting back into our old habits that damage us and then we have a chance to move and act differently and avoid pain returning in the future. Individual lessons for men and women are regularly available.